I like hot dogs. Judge me if you will. The other day we needed a quick lunch and we had some hot dogs but no buns, so I decided to improvise. Last year I had made bannock (which is a traditional native quick bread) and went with a modified version that would work to wrap the hot dogs like the old school Pillsbury dough wraps of my youth. I had my doubts, but it worked wonderfully! It would be a great recipe to make with kids, as it’s simple and they can get their hands dirty. 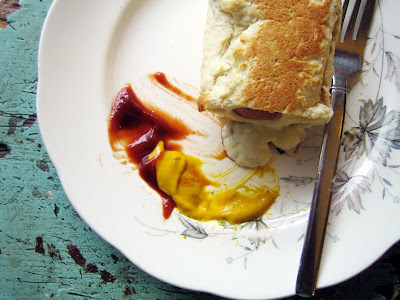 The dough was light and flaky like a biscuit and I had hidden in some cheese inside so we were greeted with melty cheesy goodness nestled around the hot dog. Mmmmm! I divided the dough into 4 but I think it could be streched a bit to cover 5 or even 6 if you pat the dough thin, as the dough did puff up during baking and eating just one was enough for a meal. It definitely made for a filling, super delicious and unusual lunch. Preheat oven to 375. In a large bowl, combine the flour, baking powder and salt together, whisking well so it’s all blended. Add the butter and crumble it together with your hands until it resembles tiny peas or crumbs. Make a well in the centre of the mixture and pour in the milk or water and use a fork or a wooden spoon to blend it gently until it forms into a lump of dough. Meanwhile, boil up the hotdogs and when they’re hot, remove from water and set aside. Divide the dough into four lumps and shape into a hotdog sized shape. Flatten the dough until it’s large enough to roll up a hot dog, place a slice of cheese on the dough and then roll up the hotdog in the dough. Pinch the ends so the hot dog is encased and place on a cookie sheet. Repeat for all the following hot dogs and bake in the oven for 10 minutes, flip the dogs and bake for another 5-10 minutes until slightly golden. Serve with your favorite condiments. No judgement – I love a good hot dog. It’s the best (only) reason to go to a baseball game! Good-luck with the awards!! Hey I might have to do this tonight! I have about 4-5 hot dogs in my fridge that need to be eaten, and this might help sophisticate them enough for my husband and I to have them for dinner too! thanks. I’m with you, I love a good hot dog every now and then. Love the simplicity of this. I used to do this at Girl Guide Camp, but instead of baking we’d cook the hot dog+bannock over fire on a stick! Awesome! Hot dogs are a big hit in my house – ever since the kids went to camp and cooked them over a campfire. I think they’d really like to make the bannock and get messy before they ate. yum! I think this is a great idea! I miss the smokey taste of a real hot dog. Tofurkey dogs are okay but not nearly as good as the real thing. I hope you win the bloggies! We have something similar here in Oz that I’ve seen called either a Puff Daddy (great name huh) which is a hot dog and cheese wrapped in puff pastry or a Smoko Dog, which is hot dog, barbecue sauce, onions, cheese and bacon bits in short crust pastry. TOO GOOD! I am in no way a food snob and love these kind of fast food-ish things. brilliance! I´ll t with a biscuit dough, which is the easiest for me. Will definitely pass on the vegan hot dog, though. I´m too Spanish to take the name of pork products in vain. Whoa! This is our favorite camping meal, except I was pretty sure that we pioneered the brilliant idea to wrap the bannock around a hot dog! I guess there’s just a universally shared natural drive to wrap hot dogs in delicious bread-products…. i am no hot dog snob, but why did people ever boil them?? it’s the grossest way to make them. grilling/toaster oven for the win. or even just roasting them. you are so handy that you can make homemade dough more easily than getting buns. i am not so handy. We used to make bannock when we were camping. I’ve also had it at the Salmon Run on the Thompson River near Chase. These look great! I definitely want to try this. Looks super easy as well. Maybe will try with some chicken sausage?? Love your blog, it’s pretty much the only food blog I continuously read! Of course I voted. Now we just have to wait and that’s the hard part! Ok, this is pretty cool. You know we make bannock around here, but my husband would love it if I made these. I don’t think I can wait until our next camping trip! you know I’m gonna try this! Cool! Looks super fun. I’m going to try this next time I’m in the mood for a dog. I think your bannock version sounds much tastier though! YUM – that sounds delicious!! Who can turn up their nose at a good hot dog? Anyone from Edmonton or Ukraine? I have a vague memory of my friends granny making something like this when we were kids. They were supposedly quite traditional, but I don’t know if they were Ukranian or a regional Edmonton specialty. She called them pee-dogs and they were highly coveted. oooooooooo that looks good! we made the old hot dog wrapped in pilsbury triangles before christmas, with mustard and cheese inside and they were amazing! these would be sooooo much better. Nothing wrong with a good hotdog. I had one for lunch today! Seriously, I have them several times a month for lunch at work, simple and easy which works for me. I’d love to work a little cornmeal into this and turn it into a baked corn dog 🙂 Thanks for the awesome recipe! No judgement here, I like hot dogs too! Giant pigs in a blanket sounds great! soon, let me know if you made them! dawn, this is definitely simple & easy! ellen, that would be awesome. haha, laural…i guess it's true wrapping hot dogs in bread = rad. lisa, i had no idea so many people wrapped hotdogs over a fire! must try that next time i camp. sleepydumpling, i love that idea! wowzers. bellini, mmm, i'll definitely have to try this out camping! kbo, thanks for the kind words! girl healthy, it's definitely fun & easy! bessicah, i hope you tried your biscuit dough in hotdogs! haha, indeed it's definitely more canadian than a corn dog! i hope you do, kntgrl! sara, trust me, this is way better than pilsbury! mrs. l, hot dogs are great, definitely. haha, great idea, averagebetty! let me know how it turns out. looks like everyone is a hot dog fan, gaga!! i made them, very easy but find the dough a bit dense. Well, I started out trying to make this but it ended up different. I ended up making some kind of hot dog casserole thing. I put a layer of bannock in a pan then I put in a hot dogs, chili, cheese and mustard. I topped it off with another layer of bannock topped with ketchup and onions. I did not start out trying to mess up the recipe. I will let you know how it turns out. My kids went berserk over these. The sharp cheddar I stuck in there with the dogs sort of disappeared into the bread. Which is NOT a bad thing. We’ll make these again. The comment above from averagebetty about adding cornmeal has me thinkin’…. Thanks! These have actually been around for a very long time. My great grandmother is Aboriginal and used to make them for me all the time, now I make them all the time. TASTY!! I’m coming back to this (again) for a superbowl snack (I’m going to cut up the dogs and make bite-sized poppers). This was a family staple for a while and we took to adding grated parmesan to the bannock–made it taste like a cheez-it.